I do love it because it's so much easier than trying to keep an ice pack on there. I love it conforming, I just went out to get the mail, I didn't have to take the pack off, it could still be on. I like that a lot. I really like it a lot, I've been using it I mean I've just used it for the 2 days but I have used it and I really do like it. thank you so much I had not expected, in your mail it said someone would call me and I was not sure. but its true someone called me and I very much appreciate it, that's very good and not only to sell some products but also you have service after sale so that's very good thank you. I really like the way they work, the cold one really helped after I got it, I did it for the first 48 hours and that really helped to reduce a lot of the swelling, I switched to the warm one but anytime if it feels like I've been walking too much and it feels kinda tired or sore I switch back to the ice. Ya I appreciated your guy's customer service. I"m doing teriffic, I've been singing your guys' praises to anyone I can find. I am going to be writing a letter to my doctor to tell him, so he can tell his other patients. I'm amazed, and it has been nothing short of a god-sent. this is great tape, I have been ordering for 3 years or so and the service is also good. I love that wrap, it's wonderful. I love your warming boot- the one you plug in with three settings. I’ve had plantar fasciitis for 5 months- trying the more traditional treatments- compression socks, rolling with ice bottles and balls, stretching- etc. When I read about your theory, it made sense practically given my experience. Well I'm really impressed with your company I gotta tell you. The continuous wrap, we just have't figured that out, but the others have been wonderful both of them the ice and the electric and it seemed to help his elbow immediately. I just have to tell you this just really made a difference all the ice packs we made and the heating pads we used nothing, and the first couple days he used these it was wonderful. Thank you for the call. I appreciate your courtesy. I am actually able to sleep through the night now. It's been helping. I've been doing therapy and my therapy is almost running out. It was still really bothering me so I thought I would give this a shot and it's helping. So far, it is excellent. I have made great strides in the 4 days that I've been using it. Things have improved immensely. I just can't thank you enough for this. The BFST feels great when it's on. It is amazing and I definitely will recommend this to others. Well gosh you guys are terrific... It's nice to deal with a company that's terrific! The products are really well made, it's nice because you can wear it. I do like that very much. I like the way that I'm able to put the ice inside the boot and how I can strap it up and I can make it tighter if it gets looser and the velcro and it works so well. And I like the ice pads, their shapes to fit. I'm very impressed with it. I wanted to say it's going really well. In a week I've been just utterly amazed at the improvement. I'm thrilled actually. I had plantar fasciitis so badly that it was to the point of hardly being able to walk even when using a cane. I had been to 3 podiatrists. The last one I went to 3 times, never feeling better, but worse and in more pain each time. I spent a fortune in shoes, lifts, equipment, etc. My quality of life had regressed tremendously- it's hard to function or enjoy life when your feet hurt all the time and you can barely do anything. I finally decided to research and attempt to treat and cure myself. In doing so, I ran across the King Brand information. It made sense! And was not exactly what the podiatrists had been telling me. The podiatrists all seemed to have gone to the same school and been trained in certain set treatments. I took the risk and spent money on your product. Even though it could have been wasted, I was getting desperate and you made sense. Within a couple of days, i had progressed from a cane to a walking stick, then to needing nothing on which to bear my weight. Your products are excellent and your customer service is superb. I still use your products on a somewhat regular basis. I can't tell you how appreciative I am for your knowledge,the company, your products, your customer service. You gave me my life back. Thank you!! They were wonderful! I couldn't even.. I couldn't get anything from my doctor that compared. I'm really pleased with your product it's really great and the instructions were fantastic... Gold star for you guys! It's just what I had hoped it would be and it's working out just fine. I'm very appreciative of having a system that works. Since I've had this for the last for days, I do a treatment in the morning and one in the evening and it's like, the inflammation is totally gone! I'm tickled, because this is one of the rare items that I've purchased without seeing other than what I read on your website and that it actually, ACTUALLY works! I couldn't be any more pleased. It's really done a complete turn around for me. I thank you all so much! They're really good products, they've helped a lot already. I purchased both the cold and heat wraps and feel they are both helping my shoulder injury. I have received my order and am in love with both the cold and hot braces! I've been searching for a long time for something and this is like amazing and so I am in love with them. I am so glad I ordered this. I have bursitis in my hip. I've been following instructions very carefully and I can't believe the difference in 3 days with this treatment and I am just thrilled! I could hardly walk, I had to use crutches, but I'm not even doing that now. it's working great, I really like it. I like the icing wrap because it fits right on there. I used the BFST for 8 months and had fantastic results with my hip labrum tear. I love the product, it's the only thing that's helped me. I am getting results, It's helped an awful lot......You have been very helpful, you have a great organization. I had ordered one of the KingBrand kits and have been thrilled with it. I know that its getting better. I've never seen anything like this, I really love, I just can't even believe that, ah I feel like it's a gift from God that I got this stuff because I don't think I would have gotten better without the BFST seriously, and I had been icing tonnes ya know with lame, I mean they are so lame compared to your ice packs, So i'm very thankful. And it's just crazy that you guys ya know talk to us. It's so great I'm really in love with your company, it's awesome. Thank you so much for your help, Y'all are so courteous, more than anyone i've ever spoke to on the phone. I really am pleased with it because it is giving me relief ! I'm feeling so much better, I can't believe it. Everything that I ordered has helped with my pain! I really like the products. I'm actually quite surprised with how quickly I am healing. I have plantar fasciitis and now have metatarsalgia and all the products are really good. I'm pleased I got them. The ice pack is great! I am very pleased. My knee decided to self destruct in February. It got so bad it was painful to just pick my foot up 6 inches off the floor. It would wake me up in the middle of the night in extreme pain. I went to two knee doctors. Both said i had a torn meniscus and had worn the cartlidge off the knee joints. But i had a bad experience with knee surgery in 1996 so i was cautious. I began to do the exercises they gave me when i had the knee surgery and take chicken cartilage gelatin. It was getting better, but slowly. Sometimes it would get set back because i hurt it while asleep. I received you knee wrap thing on April 20 and began to use it . Improvement continued, only a lot faster. It isnt well yet, but i can do everything without pain, including picking my foot up off the floor as high as i want. Ive started working out again. I like it, I like the Cold. I really like it. Years ago I bought the ankle wrap. I do like the product. I remember them being good years ago, I remember I had a problem with the plug and they sent me a new plug out right away. Like I said it's been years since I've ordered anything, but like I said I tend to turn back to this, because the foot really healed very well I felt. I've been using the cold pack and that is really nice to be able to put those cold packs around that injury so that worked really good. I originally bought your product for Plantars Fasciitis that had flared up. I had it many years ago. I had cortisone shots and it started giving me a ... it started flaring up and I'll tell you I used the icing and then I used the heat as it was easing up on me and it was really ... it's been really effective. It really worked. The product is high quality, and the customer service was responsive and went above and beyond my expectations when dealing with some issues I had with my order. Very impressive company. It works perfectly! I want to thank you and your company for this assistance and standing behind your product! They're working great. And I'm really glad I got that battery for it, when I travel or have been driving that's been helpful. Thank you so much for a great product, I've been recommending it. Yeah they're working great, really great. I'm very satisfied. Now I just need to get rid of the injury I bought it for. I'm absolutely ecstatic, my knee is getting much better quite rapidly. I'm telling friends about, it's really made a really big difference and so far I'm really seeing quite a bit of improvement in my torn meniscus. good quality product and fast service! I saw the website and I love the items you have, and actually the medical information is tremendous. I learned more from you than I learned from my doctor - it's amazing, I could not believe it, I was shocked. I appreciate that. I referred a woman to you....she bought this product (BFST) and has gotten great relief from arthritis. I know your machine works. I give the machine credit. I am grateful to you guys. I think the fact that you're willing to extend this much time and effort is a testament to your product and that you stand behind it and that it works. You're a unique product and a unique brand. I've been seeing a therapist twice a week which is helpful I'm sure, though I've been going for six weeks now. I really feel your device has made the difference, and I have to believe your good sage advice was wise counsel. I'm excited about the days and weeks ahead and believe with all my heart, I will not need a second arthroscopic procedure. I'm a believer, and my testimony may be freely shared. Again, thank you for what you do. well made, I like it very much so far! so far, so good! It's working great! I love the new boot for the ice! I can walk around with it, it came with three things and I really like that. The heating element for that is good as well, I've been using it every day! I'm really enjoying them so far, they're really well made. I have your products and it works beautifully, your unit healed my knee in 2 weeks. Yes, I have been using the wrap daily and experiencing great relief. The only problem is resisting the impulse to go back into the activities (hiking, yoga, gym and a careless twist of the menisus) that blew out my knee meniscus in the first place. Too soon, and I will be back to square one in recovery. Thank you, items have arrived and my knee is feeling better already. Products are great and I will be ordering more from you all. Love the tape! Good support--follow directions for applying. Sure helps my bicep pain. I really like them, they fit so well on my knee. It works great, It helps so much. When it's hurting really bad I just put the ice pack right on there. This is so great for me. Great tape, have bought it several times. I think it's a neat idea. I'm very satisfied. I love the products. I love that there are three gels. I have had chronic Achilles Tendonitis for months with no relief, and I'm finally seeing results with the BFST. Thank you so much for your follow up note. I did receive the knee wrap and it is really wonderful. It is so nice to find a product that really does what it says. I'll be recommending your products to everyone I know! Im not interested in returning you products, I love your products, I would recommend your products to everyone. I am really happy with your products. I love them ! I havent used the BfST yet but that cold wrap is wonderful I love it. I have chronic pain and a lot of it is around the bursitis area, this makes it feel an awful lot better. Appreciate the call. I like the quality of the product and the ease of use for both the cold wrap and the heat wrap. So I applaud the design and the manufacturer of the product. My Achilles tendonitis became so acute, it felt like I had broken my ankle. After two months of consistent use of the heat & cold, plus taping, there is a huge difference! Yesterday I took my dog to the dog park for the first time in months AND mowed my lawn without major pain! I continue to use the heat/cold on a daily basis - it feels so good &#128521; This process has made a remarkable difference, thank you!! I am delightedly blown away by your efficient, personal customer service, and all the info plusses you offer so that the treatment is successful! Thank you! It's good very, good. I've been using both products and its going great so far. I'm certainly very pleased with this Coldcure so I recommended it to a friend of mine that has somewhat same problem. I'm really happy with how well they work. Ive been using it and i feel like I feel a difference ! I'm loving it...it has helped tremendously...I tell everyone about it, thank you so much. I finished the cold cure treatments, now I'm working on the BFST. For the cold I didn't have any pain but I wanted to make sure I was okay before doing the BFST .Now i can move my thumb! I have received my shipment and have been using the ColdCure treatment for a few days now. I am very pleased with your products and very satisfied with my purchase. They're amazing! Exactly what I was looking for. I've been in chronic pain from planter faciitis, with little hope for healing. I felt myself suddenly "old" too soon,watching my quality of life deteriorate. I am blown away by what the heat treatment is doing for my foot. With almost unbelievable immediate results in only a few days (I hear myself sounding like a commericial-but it's true) I am practically pain free and I feel myself actually healing. I am SO grateful to have discovered this product! I am sure you hear complaints about your product but I am sending this to let you know that I bought it a month ago my dr was talking about surgery but I can say that your product has worked and I am so happy that I bought it. I love the products. I'm a believer! It is wonderful. It has dramatically improved my plantar fasciitis in only a week or two of use. I am very satisfied and appreciate the fine customer service. We have received our order and started using right away! Our daughter plays OVA travel team and we will definitely share your products and sites with all of the teams involved with RAPIDS volleyball!thank you so much for you time! I'm so happy I found King Brand when I did. The home R.I.C.E. I was doing was not addressing the pain & swelling I was experiencing. The relief was almost immediate with the Cold Wrap & when I started the BFST the stiffness eased & I had some increased mobility. 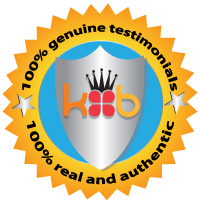 The follow-up from King Brand was prompt and people I talked with were very knowledgeable so their advisory role provide add'l help in optimizing the products as well as a confidence level that I was doing some very tried and true steps to get on a path to healing and recovery. The symptom tracker was a very clever tool to have also developed. It shows a real picture of process and documentation that can be provided to a health care provider. My only regret is that I did not find you sooner. My independent search and investigation on the Internet paid off. One other thing I must add is that the King Brand web site is so thorough and detailed that I understand very well what I would be getting from the Products. The website is a great resource in understanding injuries that involve knee, ankle, elbow & other areas. I'm very grateful and appreciative of all that King Brand offers and provides. Thank you so very much. I have only been using my Knee products for a few days and I already feel better! I have osteoarthritis and have been told my hip is worn out. I had surgery on my right hip and knee a couple of years ago. I didn't want to endure another operation which they probably won't let me at 80 years and one heart attach. I looked for other alternatives on the internet and found BFST WRAP. After using the wrap the day I receiver it, I noticed a difference right away, the pain/stiffness/heaviness I felt disappeared. I continue to use it every day every time I sit down. I also use it on my knee and shoulders. It's wonderful. I enjoy the warmth and the fact you can unplug it but still keep it on to move around to do chores. Some of the pain/ stiffness came back but I feel with continued use It will disappear. I also use the cold pak for really sore spots and then the wrap. Thank you. Absolutely love my foot products they are amazing! I love it, I love it, I love it... Ill recommend it. ...my husband and I are both happy with these devices. They seem to help a lot. My hip tends to seize up, especially later in the day. Using the BFST warms it up and relaxes it allowing motion with less pain. I was scheduled to have knee surgery on April 1, 2016. In order to prepare for surgery, I was looking on the internet for Meniscus care, that is when I came across this product. Wow, I ordered this product and religiously did the two therapies; the cold treatment, then 25 min. later the heating part---three times a day for 6 weeks, "low and behold" for exactly to the day of the 6th week program, my knee was healed!" Before this I was always limping around with agonizing pain & discomfort all the time! It a was miserable, "finally I had relief, I could attend my sons wedding, I danced and had no problem walking him down the isle. Now, I just want to continue the therapy, on occasion, for prevention. " I love this product and I highly recommend to anyhow suffering with knee pain as I for a few years!!" I just recommend that one seriously commits to using it three times a day diligently for 6 weeks! It is best to avoid going under and having surgery! I am so happy I came across the Rapid Injury Treatment Knee Neoprene Wrap with BFST TECHNOLOGY and once again I highly recommend it. Every dollar I spent on this was worth it and saved me thousands of dollars for knee surgery! I am very pleased and after months of suffering with an inflamed Achilles that made walking almost unbearable, the wraps helped immensely. I wish I had found your website sooner. "THIS THING WORKS' I am in my early sixties and have been diagnosed with a torn meniscus confirmed thru an MRI. Although I have been in varying levels of pain and/or discomfort from this knee injury for a year, I have hesitated to have the surgery to reduce the size of the torn material in my knee, which is what the surgery would entail. This conventional approach performed by a orthopedic surgeon is supposed to remove the incidence of future tearing but is a solution I was just not comfortable with. The doc told me that there isn't sufficient blood flow to this injury to allow it to heal. Enter the King BFST, an electrical device which is supposed to stimulate blood flow. Well, all I have to say is that after using the device religiously 4 times a day for just 6 weeks, my pain and stiffness are nearly gone and I have the ability to walk miles a day or even take a hike in the woods. A week long trip to Italy where I was on my feet all day and night was not only possible but virtually painless. Full healing will take longer but I now have painless mobility again. Anything which allows me to keep all my original parts in my body AND avoid surgery is surely a GOOD THING! Just realize that success with this product requires time and dedication to achieve positive results. But it is well worth the effort. Highly recommended! I think it's arthritis in my knee. I've noticed the improvement already. It's a big help. I have been so pleased with your product. I went from taking a pain reliever all day for the throbbing in my arm, to none required! I followed your directions, and with the follow-up phone calls from King Brand personnel, my issues with pain have almost disappeared. I have been using the heating pad now for about 3 months, starting 3 times a day, now to 2 times a day. There is still stiffness and some slight nudges of pain, but I am going to continue using pad, packs and tape. The tape has helped keep my thumbs from being jarred into positions that would cause discomfort. I have used the tape very infrequently. Thank-you for your continued support! Very wonderful products! I'm already walking without limping..which I was before starting these. They are helping unbelievably ! Thank you, I love both your products! This is the best cold pack I have ever owned in my life. It works miracles! I was pleasantly surprised with how fast I got my order. Remarkable products...they do as they say...better than whats said...well worth the money. I like it very much. I'm still using the cold on it and I had a doctor's appt so showed him what I was doing. He looked at it and he read it and he said it was interesting. He does approve. The pain has gone, I still have some swelling. I haven't started the BFST yet. It is a wonderful product. I did cancel my surgery this summer and am eager to continue healing. I purchased my knee brace several months ago and use it about 3 times a week. It has worked wonders and my knee always feels so much better the next day. Since I have been so happy with the knee brace I decided to try the one for my achilles. I had put off the decision to purchase but once I had I wanted it then. Lucky me they are speedy shippers and the first night I put it on I could feel relief immediately. Their products are awesome and such good quality. If you are on the fence jump on over to the side of relief! They are doing well, i'm in the middle of moving so the ice packs have been very helpful. The directions are very clear and I really appreciate it. I just used it this morning, think it is going good. I googled how to use the tape. Everything is going well. I've been doing some ice and some BFST - feeling better, no problems. Meniscus injury but it is feeling somewhat better. Thank you for all your help & professional advice. I'm sure i will be ordering other therapy products, in the future. I was amazed that the pain went away with the cold so fast. It's still there sometimes, but not as bad. I used the BFST for only 2 days so far, but I can't tell you how much of a difference it has made! They are working out well. The quality of your product is really wonderful. I have seen other things come in neoprene and it is particularly thick and feels really well made. The ice wrap is amazing. Good! Everything is working good. I have noticed it has improved somewhat but I have only been using it for a week and a half maybe and I expect these things take time. Its much better. I have been using it. I think I have a pretty severe case of tendonitis but I woke up this morning and it is feeling good. It does seem to be helping. I love the BFST part, it's wonderful. It has done really well, that's my favourite. I have the ice pack on now as we speak. So I am really pleased with the products and I will be seeing my sports medicine doctor to see where I go from here. I had an MRI and it is suspected that I have a torn meniscus. I happened to be reading about it and that's when I came across your product. It also helps with arthritis, they found that in my knee too from the xrays. Thanks for calling, I really appreciate it. It's working out fine, tried it only once and I loved it. ery good, very good, In fact, it healed up my tendonitis very well so I am very happy with it. Thank you for your follow-up inquiry. I did receive your products and have been very pleased at the relief I have received. I have a tear in my meniscus that was progressively getting worse, but after just one day of using the alternating heat and ice packs, the swelling was down and the pack reduced completely. I would recommend your product to others. I'm doing much better than I was a week ago before using these. It's the only thing I have done differently, and have noticed quite an improvement this last week. t's working well, thank you. I'm just using and taking the time to heal my injury and following all the instructions. I like the products and I will let other people know. It helped out a lot. You could tell just after one time of using it. cold pack is fantastic, fits really really well. Last year, I went on a long walk with a new pair of shoes. I wear orthotics, but had neglected to transfer them to my new shoes. This put undo strain on my right knee. Later in the week, the initial dull ache I experienced after the walk turned into sharp pains. A visit to the orthopedic surgeon and an MRI confirmed that I had torn my lateral meniscus (along with a meniscal extrusion). The orthopedist's advice was to "swim, swim, swim" - but even that was excruciatingly painful at first. My husband, also a physician, told me that I was "looking at a knee replacement" in my future. Neither gave me much hope of repairing the meniscus that I had. Several months went by and the sharp pain went away, but I had limited mobility still. Searching for an answer, I providentially found your web site. It made sense - get blood flowing to the "white zones" of the meniscus that had no blood flow, so it could heal. I have been using the King Medical BFST Knee wrap since the first of the year. After about a month of 4X/day use I became almost pain free. After about 3 months, I started walking our neighbourhood with our dog again. Now at 5 1/2 months out (I took about a month off of using the wrap - life got in the way for a while! ), I am almost back to how it was before the injury. I am using the Cold Care wrap once a day, after I walk to ease any inflammation, and am doing the treatments daily as much as I can (optimally 4X a day still). I am so thankful that someone came up with an obvious solution to the difficulty of healing meniscal tears! Thanks you for this great medical product! Thank you very much for the out standing customer service. I really liked having messages regarding the tracking and the number. It has been a great experience. I like the products so far. loves the wrap! really feels good, love it! The ice packs are perfect! Everything has been helping so much! I've been using the cold packs and just love them! Last November I hear a horrible sound in my right shoulder. Thought a tendon slipped as my arm was sore and a few muscles in spasms. After 6 months of trying to use it the rest of my muscles became weaker and weaker as if my arm was broken. But, it wasn't. When I dropped a pan of roasted potatoes due to weakness I was done playing with it. My husband and I raced, on line, to find a solution without having to go to a doctor now that our medical system in America is all screwed up. I won with King Brand! Desperate I ordered and Amber called with concern for my order and how I was doing. Wow! I knew I was on the right track. When Amber called back I could report my progress between switching between the cold to the heat and back again. My shoulder was actually partially out of place and once back in I now understand the difference and can get it back in on my own. Between the heat and cold I'm able to do accomplish arm/shoulder exercises and strengthen it so that it doesn't go out of place as often. Today, I swept a driveway and in front of my street! That's a huge accomplishment. With my daughter's wedding coming soon, I'm almost back on track at my usual pace to be the mother-of-the-bride. King Brand is a God-send and answer to prayer! I thank God for all of you!!!! I have had this Achilles injury for years, & your products are the first ones to begin a healing process. I will be able to walk again! If my treatment continues to improve my injury as it has already begun to, I will be ordering a kit for my right shoulder, which has been disabled by pain for 15 years. God bless you for the wonderful products you make available to those of us who suffer pain & disability! I absolutely love it. It's wonderful, it has really really helped, it has made a big difference, I love it! Thank you for calling, I appreciate your call. "I'm very pleased with the delivery time, it was prompt. I am pleased with the quality of your products. I am a physician and I am very familiar with such devices..."
Everything is fine, thank you. It is all pretty clear - I am healing. what a great company for making a follow-up call. Thank you so much for such helpful products!! I have been very pleased with all of the products....so much so my husband has even started using the knee wrap with BFST. Thank you for your great communication!! This stuff works great! I had a meniscus tear and I had it for 6 months. I finally went to my doctor and he confirmed that's what I had, but I really didn't want to have the operation, so I got your stuff instead. And I'm so happy with it! I use it everyday and it's really helping my knee! Seem to be doing pretty good. The BFST is tremendously helpful, just in a matter of a couple of days, already to be feeling so much better. I'm very happy. It's like so much better, Its unbelievable. I am very pleased with it. I am really really happy with it. I went for a massage last week and my masseuse even commented on how much better my arm looks. I had been suffering with traumatic lateral epicondylitis (tennis elbow) since early March 2016. I had worn several different type of immobilizers and taken anti-inflammatory medications on my doctors advice (with no improvement). I came across the King Brand products while searching online for some kind of relief. I ordered the ColdCure & BFST Elbow Wraps. I can't say enough about these products. I expected it to take weeks, possibly months to see improvement. I'm please to say that I saw improvement in days. I used the Cold Cure Wrap for about a week then started using the BFST Elbow Wrap. After a total of 2 1/2 weeks I'm pain free. What a great product! Thank you King Brand! hey are making me feeling better, know it is going to take a while. It does help me to feel better and takes away more than a little bit of the pain. Also the ones I have for my feet. I am very happy with your products. I was having sharp pain after over doing a little project. I was doing lots of ice, then have been using it and am doing really well. My husband is doing really well and I may use the shoulder product on my knee when he has finished using it. My husband is 89, if you had seen what he did yesterday and he is pain free today. I also had him on cold before the equipment arrived. We have nothing but praise for you. As a prior medical professional, I was impressed with the King Brand's informative Web site and purchased both the cold and bfst wraps. I had over-reached and strained my elbow while painting and felt sharp pain and incapacity. It took some discipline but I used cold packs 4 times a day for 3 days until the equipment arrived. Finally pain free, I started using the bfst treatment and was quickly back to work, again disciplining myself to continue the treatment, as advised. When I came in from working, I applied the cold packs and when I was pain free I used the bfst. Within 7-10 days I was pain free but remembering to continue the treatment. So impressed, I ordered the shoulder equipment for my 89 year old husband, who loves it. We both still work very hard and feel it keeps us young and healthy. We are very happy we found King Brand! I really appreciate the quality of your products. I had great results from the ColdCure Wrap. Thanks a lot!. It's for my wife, and she thinks it's a blessing! It's a hell of a product! I would like to start off saying I am always on guard about online advertising thinking they do not work.After reading testimonials about king Brand users having same symptoms that I was experiencing In shoulder area ,I ordered product.I used the wrap 3 times a day for 3 weeks before any relief was noticed. The key is to let injured area rest while you are in treatment.l tried therapy before King Brand wrap and it got worse.After 50 days of treatment I am 85 percent cured of pain and range of motion. I am sure 100 percent is in near future. Amber was my support representative and she was very helpful. Thank you for King Brand. I'm actually pretty impressed, couldn't use my hand at all and I work on cars. After 38 days of consistent use and working twelve hour days, this product has taken me from extreme pain which prevented me from working to being able to fully function. Thank you for all of your help and I will recommend you in the future to all those in need. I am an automotive mechanic who recently got De Quervain's Tenosynovitis so severe that I couldn't even hold a pen in my effected hand and thumb. Through the internet I found King Brand and decided to give the BFST and ColdCure product a chance. Within a few weeks the pain had vastly subsided and I was able to function again with minimal pain. I am now almost at the 40 day mark and I have full function back in my hand and thumb thanks to perseverance and Kind Brand. I highly recommend this item to anyone looking for a long term solution to pain. Thank you King Brand! I just finished using the knee wraps for 6 months. I injured my knee a year ago and went to a therapist that gave me exercises to do. It was killing me, but I gave it some time til I realized the injury was getting worse. So I went to an orthopedic surgeon and got an MRI which showed 2 torn meniscus on the right knee. Of course the surgeon recommended surgery. I found King Brand while searching the web for natural alternatives. So glad I did. I cancelled my surgeon after a couple of months as I could tell the wraps were helping. The folks at King Brand said the treatments could take 6 months to heal my knee. They were correct. This is my 6th month and at 65 yrs old I am pain free and walking and climbing stairs like before the injury. Thank you for a great product. This is my first ever review, I feel I owe you. As of right now everything is fine, I am very satisfied with the products. It seems to be working pretty good. I'm just getting used to using it. I have stopped using the cold and started using the BFST yesterday. It is feeling pretty good. The swelling went down a lot from using the coldcure. The other part is working pretty good. I can let you know in 4-5 days, but so far so good! My knee is feeling a lot better. I've noticed a remarkable improvement so far. Just over three weeks ago when I injured my knee I called to make an appointment to see my Orthopedic Dr. It was going to take 3 1/2 weeks to get into see him. I was in so much pain that I knew that I needed to do something to help until I could be seen. This is when I found the King Brand website, after ready about the product and the positive reviews from other customers I knew I had to try it. I placed my order on a Monday and by Thursday afternoon I was using the Cold Cure Wrap and have been faithfully using this and the BFST ever since. I had my first appointment with my Dr. today since my injury, I was able to tell him how bad the pain had been and how much better it is now. He examined the knee and said that I could have had an MCL strain but whatever I have been doing seems to be helping and keep it up for a couple more weeks before trying to return to any type of strenuous activity (walking and biking OK). No further follow up needed unless it gets worse or does not continue to improve. I know that without a doubt I would not have been able to withstand the pain I was feeling without the help of both the Cold Cure Wrap and the BFST. Both have helped immensely. I have already been using these products for 7 days. I started with two days just using the ColdCure wrap three times a day. Then I started using the BFST wrap 4 times a day and the ColdCure just for pain. I have already experienced significant improvement in just a week! I have only used the BFST for a few days and already notice an improvement. I received these products on Friday 3/25 and began the treatments right away. This is my 5th day and there is marked improvement in both pain and mobility in the left hand. I am on the computer all day and doing the BFST treatment through out the day definitely helps. Third day using this and it is making my knee feel great, thanks again! I love the tape so much! Even my doctor said it has been helping me a lot. Your literature explains everything very well. I am satisfied with everything, thank you! Everything is starting to feel really good. I have been doing them 3 times a day. I really like the tape, it adds a little bit of support (like another muscle) to help. Thank you for your excellent customer service and support! Everything is great. It is working well. My knee is feeling good. The treatments are working for me. I feel better. I went through a month of pure misery, but now it feels almost 100% better. It works great! It's helping. My elbow has been bothering me since back in November, and I finally got on the internet and looked around and my wife found your company. I've been using it and it's getting better. Since I got it 3-4 days ago, I'd say I'm 60% better already. It really really helps! I'm a commercial fisherman and in the winter we don't fish because of the ice, but we are getting ready to go back out in about 4 weeks so I wanted to make sure I got this fixed up cause it's a long season once you get out there. I absolutely love the Cold Cure/BFST Wraps. Have been using the wraps for several days now and have already experienced a great deal of improvement in the affected area. I began the treatment with the Cold Cure wraps to help reduce swelling and pain. I then started using the BFST wrap to aid in increasing the blood flow to the affected area. After several treatments, I now have less discomfort and pain, especially in the morning when I wake up. I continue to use the BFST wrap a couple of times per day and after playing volleyball, I use the Cold Cure wrap and then due a treatment with the BFST wrap. Would highly recommend these wraps. I love it. It is working out really well for me. They are great! They are doing what they said they said they would do! It's very helpful. I'm liking it a lot. I think they're great! I love them! Things are working out well. There are notable improvements and it is really helping. I am walking much better and the swelling has gone down. I've never returned a phone call to a supplier but I'd like to tell you guys, my elbow was killing me for four months until I got your tape and your elbow wraps and they absolutely made a huge change, so thank you guys and your product really works. Thank you for a good product. I LOVE this thing! It makes my feet feel soooo good. I went a year with this pain. This device has been my savour. Thank you! The King Brand icing booties are perfect, fit my small foot, put the ice right where it needs to be, and can b pressure-molded into the instep for total contact. The energy web treatments are the only relief I've gotten and make my foot feel energized, no pun intended! Many thanks for all your speedy replies and the TLC both you and (especially) Janis have provided over the months. Plantar fasciitis is so painful and slow to heal, and for a very active, now 65 years old woman, I cannot imagine just going along with what our USA medical system makes available. No-woo-woo, they really work! And, that's from a BS Nurse! With my outside shoulder/deltoid region experiencing pain consistently for months, a football and tennis repetitive injury, I went online to research treatment. That research confirmed my previous practice of icing the injured area, but added the concept of Blood Flow Stimulation Therapy. Impressed by the King Brand website and products, I purchased the outside shoulder cold wrap and the BFST wrap. After 2 weeks of disciplined application of the prescribed program, I progressed from continuous shoulder pain to almost no pain. Another 2 weeks and my shoulder feels pretty good. I am not yet completely healed, but the therapy has brought me back to a pain free condition, which has allowed me to continue coaching my son to be the next tennis star! King Brands customer service has also been a pleasant surprise of product and application follow-up, something I have never experienced before. The cold has helped soooo much! I purchased the ColdCure Wrap for my adult daugther. When she was pregnant last year she came down with carpal tunnel mainly in her right hand, arm. She also came down with other ailments during her pregnancy. Once she delivered everything went away?? However once my grandson turned 6 months old she got the carpal tunnel again. She does use her hands and arms etc on a daily basis. So something like carpal would be expected, but in a few years. It took me 25 years before I came down with my carpal tunnel in both hands. Anyway going back to my daughter she was in lot of pain and had a hard time just trying to pick up the baby. I jumped on the internet trying to find some kind of relief. I found King Brand Products and decided to give them a try. I ordered the tape & ColdCure Wrap. It arrived within 48 hours. We put the pads in the fridge and after a few hours she put it on and decided to sleep with them on. She got up during the night and changed the pad. In the morning she felt 90% better!! Her hands were just a bit still swollen. But the pain was gone!! That was about 2 weeks ago. She hasn't used them again. But when it comes back, as I am sure it will. We have the medical equipment that will help relive & put a stop to those flareups. So far so good. Thank you King Brand for making a product that works. My husband just loves the product! I think it's a wonderful product! I really like the elbow cold wrap too, along with physical therapy I received for 8 week took away my pain in wrist and elbow. The coldcure has been helping a lot. They are amazing! It's a great product. From the first time my wife used it, it was unbelievable. She strained her patella a week and a half ago and couldn't walk. She couldn't take a single step without being in severe pain. We did a couple PT things and put some cold on it. But we got your product and within 2 days she was walking! Like normal! It was miraculous. It was shocking. Very very helpful. I am much better. My knee was pretty bad. It took me a couple months,thankful for your product, it arrived and little by little I really am almost back to normal...Thank you so much for checking in on me and am very pleased with the products. I love the pre-cut tape. Will be ordering more for sure. I like them, they work great. This stuff is amazing. It has healed the plantar fasciitis in my left foot and helping a lot with the right. These are working really well! Everything is going well. It's working! This is just fantastic! Tell whoever designed this that it is wonderful! I had this horrible tennis elbow for about two and a half months, and it was just awful. I kept freezing it and nothing was happening. I used the BFST for one day and I can barely feel the pain. It's unbelievable! I was so sceptical. It was just another thing off the internet and it wouldn't work. But honest to god, I work up this morning, and usually I can't even stretch my arm out, and i was like WOW! I think it's great. It definitely works! It's unbelievable. I was ready to give up golf. Your Customer Service is above & beyond. I used 3 gels today and it works! I was really very skeptical... wow what a difference! The swelling has dissipated. This is only the 3rd treatment I've had. All week long I was using a regular icepack and it didn't make a difference..... I really wish I had bought this sooner. I'm impressed already. It feels good too! I have been suffering for the last three years and a half from Achilles tendonitis in both ankles. I had seen so many doctors and I have taken so many different kinds of medication. Medication from pain killers to muscle relaxants and also cortisone shots and none of them helped. Even physiotherapists didn't help. Ultra sounds and shockwaves did not help either. The last Doctor I've seen told me to keep taking medication and said " I'm sorry I cannot help you". Honestly. I lost hope. I tried king brand best wrap with cold wrap and now after 1 week, I can walk and I hardly feel the pain and I hope it will be gone soon. It's a great product with excellent customer service, I hope them success. Everything is good. I find they have been quite helpful so far. It is the best thing I have ever bought! We love it! It works better than either of us could have ever imagined. Amber, Many thanks for your outstanding help!! thanks for sending the follow up inquiry. i received the device less than 48 hours after you shipped, with regular shipping. Been using it, working great! I finished my cold treatments yesterday and just started the BFST today, but I have already noticed a marked improvement. The tape has been helping so much. I really like them. ...our phone call really clarified the process...especially the part devoted to those, of which I'm part, who think more is better. Thank you! My knee is so much better! It was exactly what I needed. I can't believe how much better my knee is. I ordered the knee combo with ColdCure and BFST and tape: about 2 months ago. I knew I had a tear in my knee (5 mo. ago) and I did nothing about it hoping it would heal on it's own--but it didn't--the pain continued to increase. Looking for an alternative to going to the doctor, I found King Brand and made my order. I was very impressed right away just after applying the coldcure--the pain seemed so much better. After 6 days I applied the BFST 6 times a day. I was jumping for joy! within two weeks it felt 70% healed. This could never happen on it's own. This is probably the best purchase I have made -- it's a Godsend. I would also like to mention that: I am not totally healed yet and I am applying the tape and found this really helps when I'm walking around and also helps while sleeping because sometimes a movement might bring pain and the tape holds the tissue together to prevent movement pai. I am a big fan of KingsBrand and at my age (70) I need all the help I can get to help heal those aches and pains. I love the BFST and recommend it to everyone! The customer service is fantastic. So genuine. I love the support tape! It is absolutely the best! I absolutely love them. I've been bragging to everyone about them! I have only had it for 5-6 days but I couldn't move my arm and I was in a sling. I own a ceramic studio and I was back packing and pouring moulds today with my arm. I can move it now and it doesn't knock me to my knees in pain. I'm a real believer in this thing! I ordered the elbow wraps for my tennis elbow and they are awesome. It is just wonderful! I love the products. They are great! The cold gave me so much relief! It was so nice. I dislocated my knee in my yoga class. I bought the elbow wraps for my tennis elbow a couple months ago and it helped so much I bought the ones for my knee. I love your products and have told my son's schools athletic department all about them. Thank you! Thank you for contacting me, I really appreciated your follow up and help. Everything is working great. After using it only 3 times, I already am noticing an improvement. The energy web is a FANTASTIC product. I was suffering daily with extreme pain from Planters Fasciitis. I had tried all kinds of therapy, rest , excercise, ice,etc and nothing made such an extreme difference till I got the energy web and began doing 20 minute treatments three times a day. It actually healed my foot and removed the pain! Thank you for helping me get back to tennis and running!! I'm very impressed that your company offers this (consultation) service to its customers. FABULOUS! I am just so thankful! These products are working great! !